Lambert, trumpet; Dr. Krystal McCoy, soprano; and Dr. Canès Nicolas, violin; will perform pieces at this concert. Two of the department's collaborative pianists - Tracey Bradshaw and Rebecca Curtis - will accompany soloists, as well as perform piano solos and duets. Musical numbers have been selected to highlight many influential composers. These include Claude Debussy, Ottorino Respighi, Johann Sebastian Bach, Astor Piazolla, Arthur Jarvinen, and SUU's very own resident composer and department chairman, Dr. Keith Bradshaw. 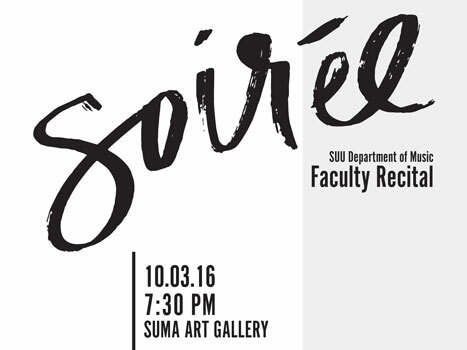 Soirée is free and open to the public. Don’t miss this moving performance. For more information, please visit www.suu.edu/pva/music.